Basically all of Blu's phones as of the last year or so have been released with Android 4.2.2, leaving users waiting for any sign of an update to put them past Jelly Bean. We've known that the company planned on pushing KitKat to a number of devices towards the end of June, and it has now released the initial devices that will be the first to get 4.4, along with a statement on Facebook. This is an interesting list, as it contains a wide variety of devices – everything from the newer, high-end devices like the Vivo IV to lower-end handsets like the Neo 4.5. Surprisingly, many of the company's newer, more powerful handsets, like the Life Pure XL, didn't make the cut for the first round. It ensured users on its Facebook that "if [their] device is not supported at this time, [they] will do [their] best to do so in the future." 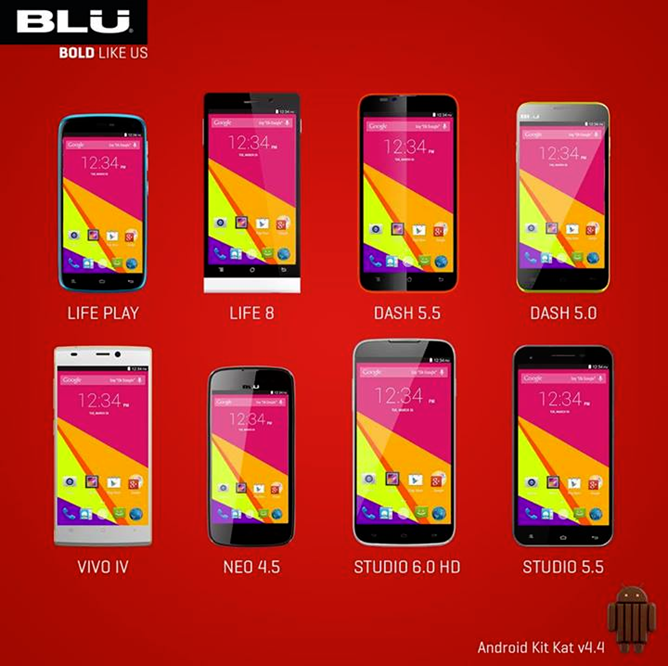 Dear BLU Fans, here are the models confirmed that will support Kit Kat upgrade. We're putting the final touches on testing and will begin releasing these in the coming days, one at a time. If your device is not supported at this time, we will do our best to do so in the future. We hope this clears the air on questions as to which devices will be supported with Kit Kat upgrades. Please remember BLU is always working hard to make our customers happy and constantly improving, unfortunately sometimes things take time. Thanks for your patience. I have been told by Blu that devices like the Pure, Pure Mini, and Pure XL would be getting KitKat prior to this announcement, so I'm not sure what's going on. We've reached out to them for further statement and will update when we hear something back. Update: Unfortunately, Blu isn't confirming nor denying other devices at this time. Guess it'll be a waiting game moving forward.